The time is 1985, one year before Ronald Reagan’s massive Tax Reform Act began a sweeping overhaul of the federal government's byzantine Internal Revenue Code. The place is Peoria, Illinois, a gritty blue collar and farming town in America’s heartland. In David Foster Wallace's The Pale King , Peoria is home to the IRS’s Midwest Regional Examination Center, or REC. The IRS, of course, is the bureaucracy of all bureaucracies, or as a character in the novel describes it: “arguably the most important federal bureaucracy in American life”. The mission of the IRS is to administer the income tax code, one of the most staggeringly complex pieces of legislation ever stitched and bolted together by the U.S. Congress. As the novel unfolds, the IRS is in the throes of change. The old guard IRS employees see themselves as being on a moral mission – it is the civic duty of all U.S. citizens to pay taxes without cheating, and it is the duty of the IRS to enforce this. However, there is a movement afoot – “the New IRS” as David Foster Wallace calls it – to run the Service like a business, to maximize profits and minimize costs. Thus, IRS examiners not only look for errors and fraudulent returns, but also weigh the gravity of the erroneous or false return against the amount of revenue it will generate if it is selected for audit. Small potatoes fraud is passed over or flagged for an IRS letter, and only those returns guaranteed to produce a large chunk of revenue in recovered tax and the attendant penalties and interest are flagged for an audit by an actual human. The New IRS is personified by the shadowy Merrill Errol Lehrl, who believes in the occult, and who employs the "fact psychic" Claude Sylvanshine and his partner Reynolds to sniff out happenings at the Midwest REC. It seems that old guard director DeWitt Glendenning (the Pale King, for reasons unexplained) is assembling the most talented examiners from around the country for a showdown against Lehrl’s efforts at computerization. All this takes place in the age of COBOL, when computers were giant mainframes locked deep inside sealed, air-conditioned rooms. Wallace identifies this moment as the point in time when the relationship between man and machine began to change – when the first steps at automation started in earnest and the first instances of job elimination occurred, as America passed from the late stages of the industrial era into the information age. If Lehrl’s computers outperform Glendenning’s human examiners, a rip-tide of automation will sweep through the IRS. This struggle seems to be the main plot device of this unfinished work. Wallace thus constructs a universe based on the Peoria REC, much as he once created a universe centered on the Enfield Tennis Academy – ETA – in Infinite Jest. He populates this universe with an amusing and somewhat sad collection of misfits and neurotics. Those examiners who have the mind-numbing job of reviewing each and every routine tax return for possible audit are known as “wigglers”. They work at “tingle tables”. “Cart boys” bring them fresh tax returns as they toil away under bad fluorescent lighting in the windowless exam rooms. Their ranks are swelled at tax time by seasonal workers known as “turdnagels”. Among the cast of wigglers are: David Cusk, a man subject to horrific attacks of flop sweats in social situations; “Irrelevant” Chris Fogle, who was “called” to the IRS through a religious experience that happened while listening to a Jesuit priest at DePaul University extoll the virtues of accounting; two David Wallaces, one whom we never see, a valuable, high-level auditor, and David Wallace the sometime narrator, who is mistaken for the “valuable” David Wallace through a computer glitch, but is really just a low-level wiggler with a horrendous case of acne and a back story that is almost identical to David Foster Wallace the author of the book; and Meredith Rand, a beautiful but disturbed woman who was admitted to a psychiatric hospital in her teens as a result of self-mutilation. Each character has some type of neurosis or oddity that makes him unfit for normal society, but wonderfully suited to work at the REC, where each day they toil away at the soul-killingly boring job of reviewing the vast mass of citizen tax returns. All of this is presented in Wallace’s signature collage technique: multiple narrators, character biographies weaving in and out of the novel in seemingly random fashion, lots of footnotes. One of the major themes is boredom, and the possibility of transcending boredom through intense concentration. I learned, in my time with the Service, something about dullness, information, and irrelevant complexity. About negotiating boredom as one would a terrain, its levels and forests and endless wastes. Learned about it extensively, exquisitely, in my interrupted year. Wallace suggests that we can move beyond boredom through intense concentration. There is a character toward the end of the book named Shane Drinion who listens to Meredith Rand’s story of her hospitalization, over happy hour drinks in Meibeyer’s, the local watering hole for IRS agents. His ability to concentrate and focus on Rand’s (interesting, but at times boring and always self-absorbed) conversation is so intense that he begins literally to levitate off of his chair. Drinion is also able to use his gift of concentration to transcend the intense boredom of examining tax returns. Perhaps this concept of boredom and drudgery is a metaphor for the writing process itself. There is one character, a young boy, whose “goal was to press his lips to every square inch of his own body”. The goal may be tedious and unattainable, but he spends hours stretching and doing chiropractic exercise in its pursuit. The Pale King was unfinished at the time of the author's suicide, but it is still over 500 pages long, assembled by the editor Michael Pietsch from over three thousand pages of manuscript and notes. Wallace told his friend, the writer Jonathan Franzen, that he needed to produce “a 5,000 page manuscript and then winnow it by 90%” to produce the final novel. This insight into Wallace’s writing process is revealing. Since writing is mostly a hard slog, broken infrequently by inspiration or joy, the process of creating a one thousand page tome of the quality that Wallace demanded of his work must have been very similar to that of trying to touch every part of your body with your lips. If Wallace had finished this novel, it would have been a one-thousand plus page work on a par or better than Infinite Jest. The story was just beginning to develop, characters were starting to gel. Unfortunately, we will never know what this novel could have been. Fortunately, we have this work in progress as artifact. Even a paragraph of David Foster Wallace's is well worth reading, and highly instructive in the craft of writing. The book is also contains a send-up of the memoir form, and of our expectations that the narrative be “true” in the wake of the James Frey and J.T. Leroy scandals (the faux David Wallace makes reference to Jerzy Kosinski). 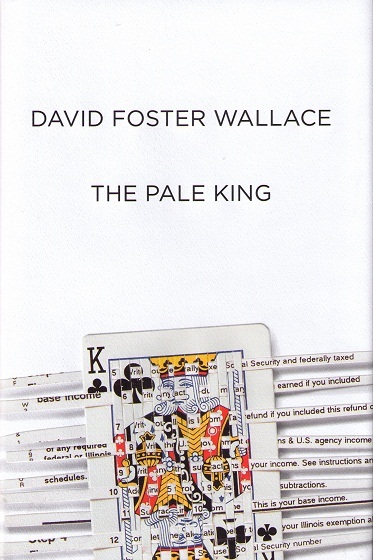 As the faux Wallace puts it: “The Pale King is basically a non-fiction memoir, with additional elements of reconstructive journalism, organizational psychology, elementary civics and tax theory, &c. Our mutual contract here is based on the presumptions of (a) my veracity, and (b) your understanding that any features or semions that might appear to undercut that veracity are in fact protective legal devices, not unlike the boilerplate that accompanies sweepstakes and civil contracts, and thus are not meant to be decoded or ‘read’ so much as merely acquiesced to as part of the cost of our doing business together, so to speak, in today’s commercial climate”. So what we’re in now is some transition in the economy and society between the age of industrial democracy and the stage that comes after, where what industrial democracy was about was production and the economy depended on constantly increasing production and the democracy’s big tension was between industry’s needs for policies that abetted production and citizen’s needs to both benefit from all the production and still have their basic rights and interests protected from industry’s simpleminded emphasis on production and products. In investigating boredom, drudgery, the change in the American economy away from a government regulated industrial economy, and the subsequent impact on the average citizens of the US, Wallace has in his sights the very root of our country’s problems today. While Infinite Jest was a brilliant work with hundreds of ideas and facts whirling in its vortex, it worked mainly in the vein of satire. The Pale King takes dead aim at America, and does not miss. Most of this we get by reading the extant text. A little more is gleaned from the Notes and Asides at the end of the novel, where the editor Pietsch has added some helpful insights and ruminations that he found among Wallace’s collected working papers. My opinion is that if Wallace could have mustered the needed strength and perseverance to finish this work, he would have outdone himself, and this Pale King, if that remained the final title, would be a work of genius surpassing even Infinite Jest. At this point, the fact of Wallace’s suicide comes up: why did he do it? Was his inability to wrestle this great beast of a novel to the ground and finish it somehow a factor? We will never know. That he was blocked with his work when he decided to quit Nardil – was bored with his old tricks and unable to muster enough excitement about his new novel to find a way forward with it- is not inconsequential. He’d loved writing fiction, Infinite Jest in particular, and he’d been very explicit, in our many discussions of the purpose of novels, about his belief that fiction is a solution, the best solution, to the problem of existential solitude. Fiction was his way off the island, and as long as it was working for him-as long as he’d been able to pour his love and passion into preparing his lonely dispatches, and as long as these dispatches were coming as urgent and fresh and honest news to the mainland-he’d achieved a measure of happiness and hope for himself. Wallace had been on Nardil, an antidepressant of last resort, for depressives who have tried all other medications to no avail, for 20 years, and then tried to stop taking it. Quitting outright is said to bring on extreme anxiety and depression, and this may have contributed to his state of mind at the end of his life. In the end, all we have is the memory of an extremely talented writer, his finished works, and this fragment of another ambitious project. The Pale King, as thoughtfully assembled by his editor at Little, Brown, gives us a glimpse into Wallace’s writing process and lets us imagine what the finished work would have been like. And offers a lot of good reading in the process. No one writes like David Foster Wallace wrote. 8 Responses to "The Pale King: David Foster Wallace's Adieu"
Claudia, one chapter in this dead man's half-novel is worth more than ten thousand Franzen Freedoms. Franzen has the eye but lacks the heart. Thanks for this piece of writing, this review. I suppose I shall one day try The Pale King. Am still on Infinite Jest, a long and difficult and insanely brilliantly book. Or should that be brilliantly insane? Noone writes like he did, no, you are right. I don't quite know how he managed to write such a work as Infinite Jest. Every other sentence has a difficult word or cultural phrase, some brand or other, some psychological symptom, some particular street name. He is like the complete opposite of a writer like Bukowski. I don't have much of intelligence to say about the guy, just that he was one hell of a writer. I am not certain I "enjoy" his books, as they are claustrophobic and thick with words words words, but he sure saw the world in a very clear and troubling way. I think there is satire in Infiniite Jest, lots of it, but there is also a deeply troubling, unwavering stare at the world, a profound sincerity, a dark honesty. I am 235 pages in still and keep having to read sections over to get them again, so thick is the prose. But I will soldier on. You may not "enjoy" reading David Foster Wallace--well, I don't exactly--but you get something out of it. Something. Not sure what that is entirely, but it is certainly something. What a mind he had. Sorry this wasn't about The Pale King, this response, but I haven't read it, have only read part of Infinite Jest, a book like no other I have read. michaelamichael - it is truly rewarding to read Infinite Jest, because you are reading a book by a writer who has an almost infinite imagination, an almost infinite knowledge of many things, and the incredible writing skills to bring this all together. Same goes for The Pale King. You must soldier on. Just wondering how the author came up with the name Meibeyers for a bar. Did the author know anyone named Meibeyer? Wallace is a crappy crappy crappy, 'writer' of such staggeringly amateur stature his inept sentence-building and hands-off editing protocol has the effect of kryptonite on anyone with a lick of sense and discernment. Just the hallowed, shaded passages above shout 'PENCIL-LUNCHBAG-RECESS'. That anyone considers this crap brilliant (or 'insanely brilliantly' as MichaelMichael puts it) is proof that the Eloi are ascendant and the dissolution of our libraries has already begun in absolute earnest. Or as DFW might say "..when he looked out of the window he was reminded of the many things he was reminded of. The buildings full of books would come crashing down and submerge his mindset in a pasture of which no dirt would be left over but the existential nothingness we are all made of." dfw is three espressos, a tween and a typing machine. People, READ HIS SENTENCES. CHANCE THE GARDENER. Why Tom McCarthy is emerging as the best postmodern novelist on the scene today.